Taking inspiration from the abstract blue hues of a painting, I decided to give graded watercolour calligraphy a try. The plan was to start with very diluted colour (Cotman's Indigo: links to Amazon.co.uk) and gradually add more pigment over the course of the piece. 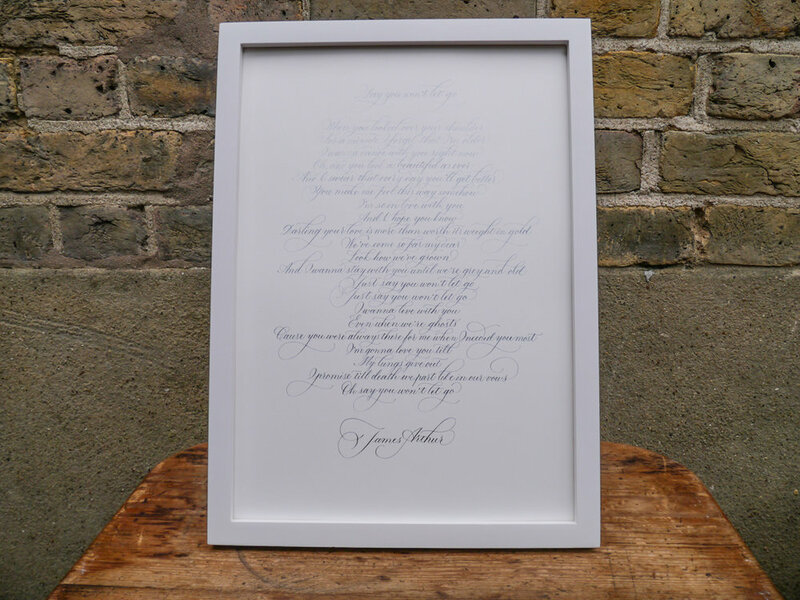 I worked with a section of the moving James Arthur lyrics from his song, Say You Won't Let Goon Bockingford 300gsm watercolour paper at A3 size. I used flourished Copperplate script for a traditional style with a little flair. Satisfyingly, the gorgeous blue gradient ended up looking exactly as I planned — deepening dramatically with the words down the page. Before I started, I worked out that, for 23 lines, I would add more colour approximately every 3.5 lines, building up the hue six times over the course of the full piece. My method of mixing was an inexact science, simply dipping my brush into the saturated watercolour pan and moving across into my diluted colour. Of course, the saturation could be decreased or increased, depending on how long your piece and the final look you're going for.